← All Stars Series – Round 3 at Oakleigh, Vic. Alexander Peroni will be travelling to Italy with his father Piero at the end of the month of July. Their mission is to tackle the Italian National Championship which will be run at the Siena race circuit on August 19 to 22. Alex will then compete at the World Series Karting event at the same venue on August 29. Alex will compete using a Galiffa tuned LKE 60cc engine aboard a CRG VK1 chassis under the guidance of Alessandro and Simone Ottaviani who are the principals of the CIK race team. 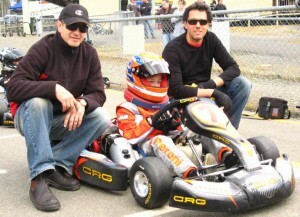 Concept Karting and CRG Australia wish Alex and his dad Piero the best of luck in their venture. Recently the Italian karting magazine T Kart wrote an in depth article on Alex’s racing in Italy. This article is displayed for those of you who can read Italian. Isn’t it fantastic that one of our own is recognised overseas for their efforts. Please click on the thumbnail below to go to article.